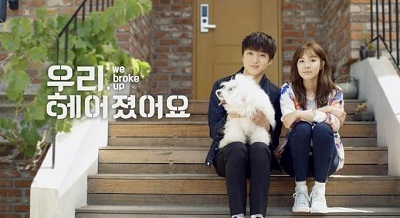 "We Broke Up" tells a story of a couple who happens to live together after their breakup. No Woo-ri (Sandara Park), a bright and ambitious girl who struggles to land a job while Ji Won-yeong (Kang Seung Yoon), an indie band’s vocalist who works part time at night. Hyoni Kang will appear as a confident career woman who runs the nation’s top music label, and Cang Ki-yong will play the role of the couple’s college mate. A short cute love story in a modern universe, well with modern I mean it’s a situation that is very normal in our day and age. So nothing special about this web drama, it was really simple. Even their acting was so ordinary. I can’t hide that I’m a little disappointed in Kang Seung Yoon, I did expect more from him, since he was my favorite from High Kick Through the Roof 3. I’m still new to Sandara Park, so no disappointment since I didn’t expect anything either. The storyline was cute, but really stretched out. Although that’s nearly impossible, since it’s a 10 episode a la 15 min each episode. It felt like there were no main story that glued it all together, but I can’t say it was a waste of time, since I enjoyed it a bit. It’s a good drama to wash away your feelings from the previous drama and make you ready for the next one.